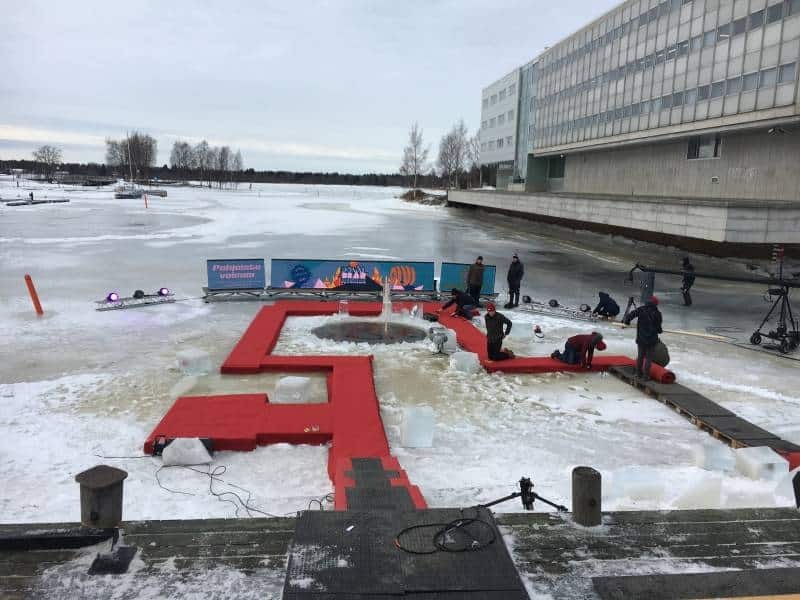 The Polar Bear Pitch, held in Oulu, Finland in the dark cold days of mid-February, is an annual event for startups pitching their ideas for the chance to win the 10,000 euro prize and, more importantly, get coverage and interest from media and investors. 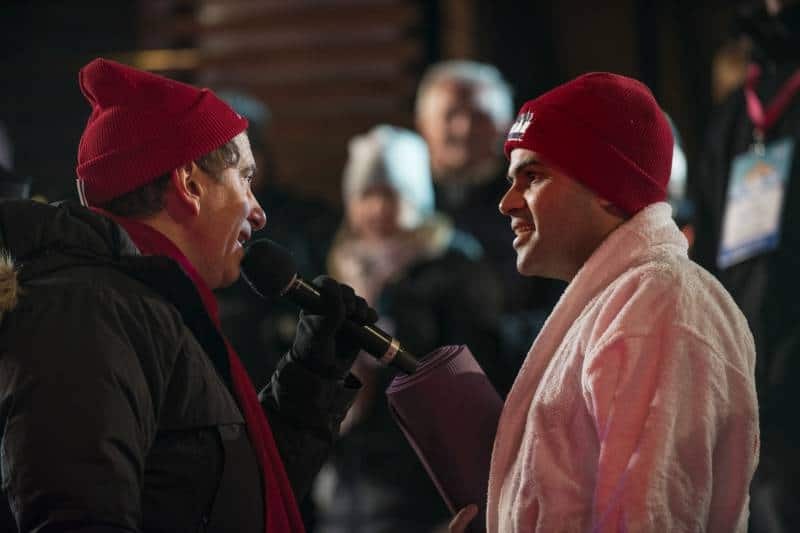 In this year’s challenge, 17 start-ups braved the icy waters of the Baltic Sea for a few minutes, each trying to outsell the others. CityFALCON was one of the finalists fortunate enough to participate. The rules of the competition are simple once you’ve made it to the finalist stage: get into the water, pitch your startup and its concepts or goals, and wait for the voting. Of course, there are a few obstacles along the way, like the incredible mental challenge of forcing yourself to think about your company when your body is telling you to think about… well, your body. But for me, CityFALCON’s founder, the company is like a child, and sometimes parents sacrifice themselves for the sake of their children. Why Endure This Ridiculous, Frostbite-prone Challenge? Starting up a business is hard work, and many people pour their lives into their companies. I am no different. The challenge, while perhaps not widely known to the general public, is not only a way to win a cash injection, but a way to win the hearts and minds of new investors and customers. Everyone walks away from the competition with at least a video of their pitch posted on the internet, and, as we all know, techies like strange things. It follows that techie investors might be browsing for something odd, stumble upon the videos, and start watching. It is also a good way to stick in prospective investors’ minds, because who would forget the guy who jumped into the Baltic in February? If we are serious enough to do that, then we are serious about disrupting the financial news space. I had other, more personal, reasons, too. First, it is an exclusive event. There are thousands of companies out there vying for investors, but only 17 teams made it to the finals. It is also a good way to motivate the team: they see that I am clearly vested in the business if I’m out freezing myself to garner press. They can feel confident I am willing to do whatever it takes to promote my company. By extension, they also know I am committed to keeping them their jobs because my company relies on them. I also have a personal connection to Nokia, for whom I worked in London, and Finland is the home of Nokia. Moreover, I am interested in tech, which the residents of Oulu like to test out on a community-wide scale. The town has earned the label of a “living lab” for this enthusiastic adoption of technology, and I wholeheartedly agree with their embrace of technology – I run a tech startup, after all. My most personal reason was to overcome my fear and prove to myself that I have what it takes. The cold, the audience, the cameras, it was all frightening, but I kept calm and I carried out my pitch. It also went longer than I expected, so I now know that I can persevere through anything. Preparation for this kind of event takes time and effort. One does not simply fall into the icy water and start talking about one’s company. I spent weeks on preparation for my adventure. I had never been afraid of the cold, but I also never experienced cold like Finland’s. 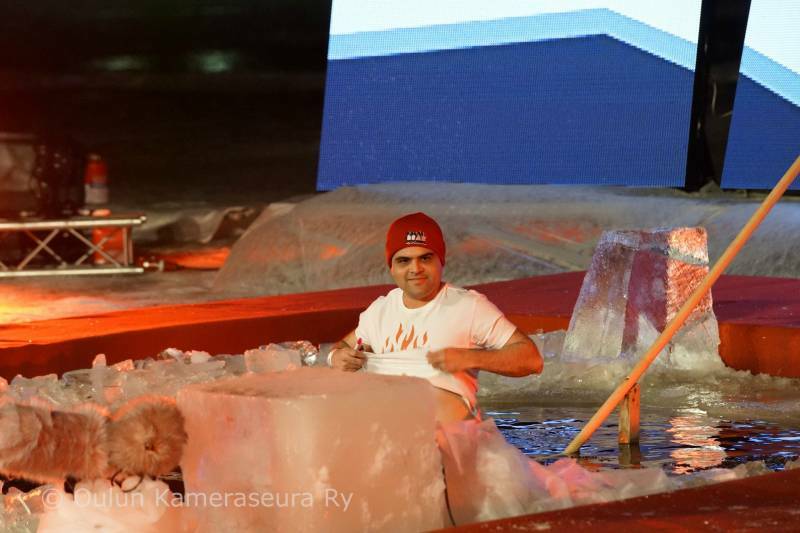 I especially never willingly immersed myself in ice water. I am a native of India, which happens to be quite warm. Now I live in London, which certainly gets a bit chilly, but the average daily low in February is a toasty 2.1C compared to Oulu’s -13.3C. In fact, Oulu’s usual high is colder than London’s low. It took a lot of yoga and meditation practice to build up my mental fortitude. Then, after getting over the temperature differences mentally, I still had to overcome physical barriers. I needed to train for cardio and lifting, and I had to stop drinking alcohol. Breathing techniques were learned. The pitch was honed to 3 minutes. Cold showers and single layers of clothing were embraced. I read a lot about ice swimming, breathing in ice cold water, hypothermia, frostbite, and the story about the survival of passengers in icy water after the Hudson river landing. I must say, I even drew inspiration from the scene in the movie Titanic where Leonardo DiCaprio is trying to survive in the icy North Atlantic. The day before, it started to get quite chilly again, but I had made it this far. I wasn’t about to let the preparation go to waste. Looking out over the Baltic, I started to get a bit nervous. However, most of the other startups were also nervous, so at least I wasn’t alone. People faced with similar fears will often bond, and I enjoyed the time I could spend with entrepreneurs from all over the place. Right before the competition, I decided that 3 minutes was probably too long. With the cold bearing down on us, I wanted to get in and out as fast as possible, so I cut the pitch down to 1 minute. Anyone who has tried to promote anything knows 1 minute is not much time. Those who studied business at the university know about the “Elevator Pitch”. The elevator pitch is a highly polished, succinct promotion of oneself, and I was approaching that time frame. 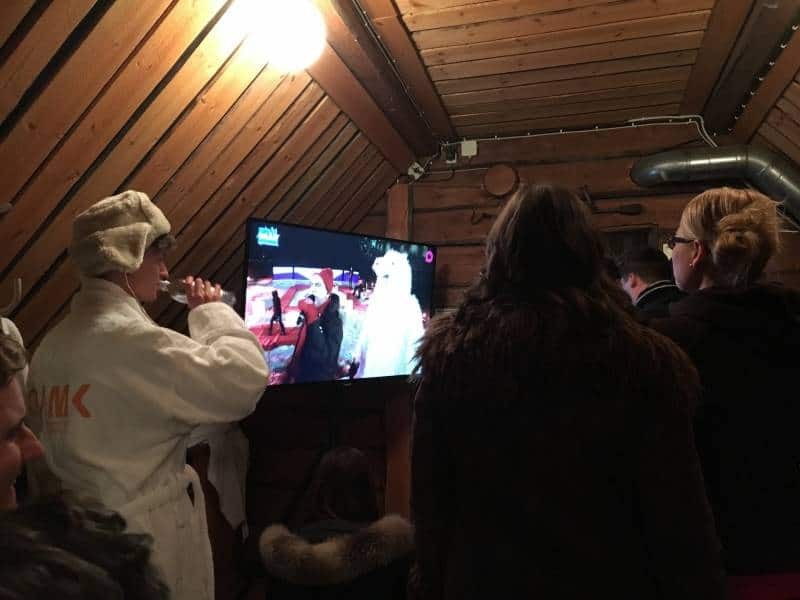 As I watched from the comforts of a heated room, the first contestants seemed to be doing well, which added a lot of excitement and encouragement to the attendees and other participants. We were thinking “it probably isn’t that bad…”. The people jumping in also got to sit in a cosy, heated area before their turns, while they watched the others jump in one by one. During the short interview beforehand, I seemed pretty calm and collected. 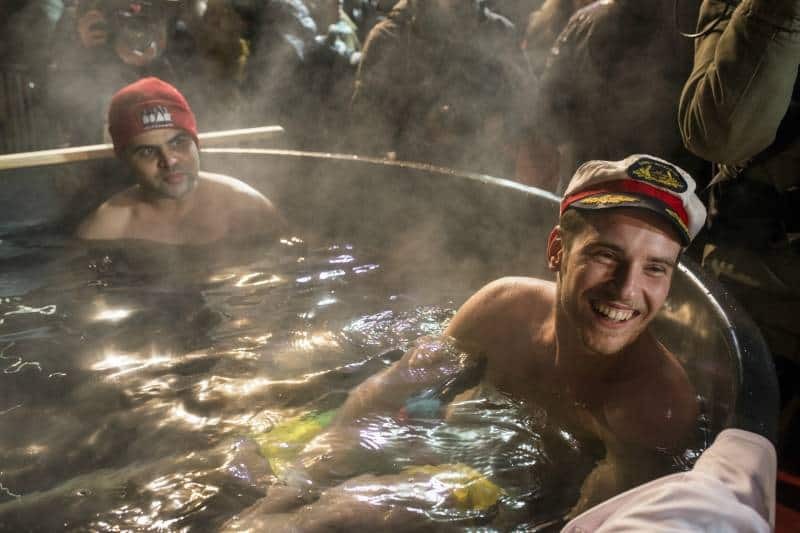 Under the surface, however, physiology had a different response: racing heart, foggy mind, and a little sweating – even though it was absolutely freezing outside. I wish I could say I was made of steel, but I am not. 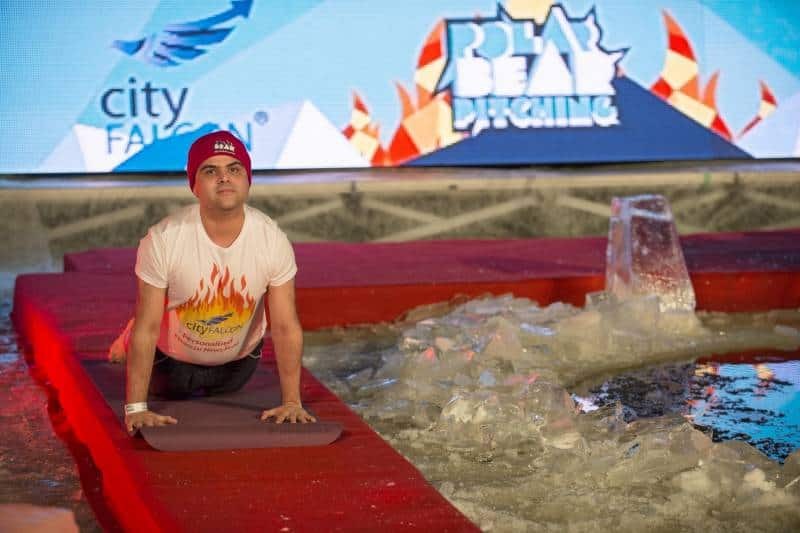 To add some variety and something easily recognisable, I had decided to do a little yoga before the plunge. It also helped me calm down and focus on the task at hand. Before a pitch for Microsoft Accelerator, we (my team and I) did a dance routine. But I wasn’t interested in dancing by myself on ice, as it would probably have ended with me smashing my face on said ice. That would’ve been memorable, too, but not in a good way. Actually walking in the water was fine. I was somewhat surprised. I wasn’t putting on a façade when I said that. But then I slipped a little and the realisation hit. It was absolutely frigid. The yoga and meditation practice did not withstand the cold, and I forgot the pitch. This is where individuals in high-stress situations, like soldiers, need to rely on training and any memory triggers. Luckily for me, I had two props (a music cassette and a pen) still in my hands and a well-practiced pitch to rely upon. In the hole, everyone was staring at me from the black void that is a northern Finland night, and my breathing caught in my chest. Time to impress. Have you ever fallen into a freezing lake? I hadn’t before this night, but I’ve seen lots of movies. I did get into a cold shower once by accident, and my breath caught. This was nothing like that. This was much worse. Most people wouldn’t do this, but I seriously believe in my company. This was my time. Once I remembered the props in my hands, off I went. I spoke about how CityFALCON will be a personal financial assistant, how we offer personalised financial information, and how we are using technology to sift through the mountains of data available to the public. I surprised myself by hitting 3 minutes almost exactly, which I attribute to my focus on the pitch and raising the money. But I don’t think I will ever immerse myself in icy water in the future just for the fun of it. Coming out was brutal, as the icy air was no better than the icy water. I was completely numb. I couldn’t feel anything, but the hot tub offered solace. I wasn’t so concerned about winning anymore. You know that feeling of accomplishment you get after conquering some fear? Sometimes you don’t care much if you win the competition anymore, you are just proud of yourself for persevering through the ordeal? Well, that’s how I felt. 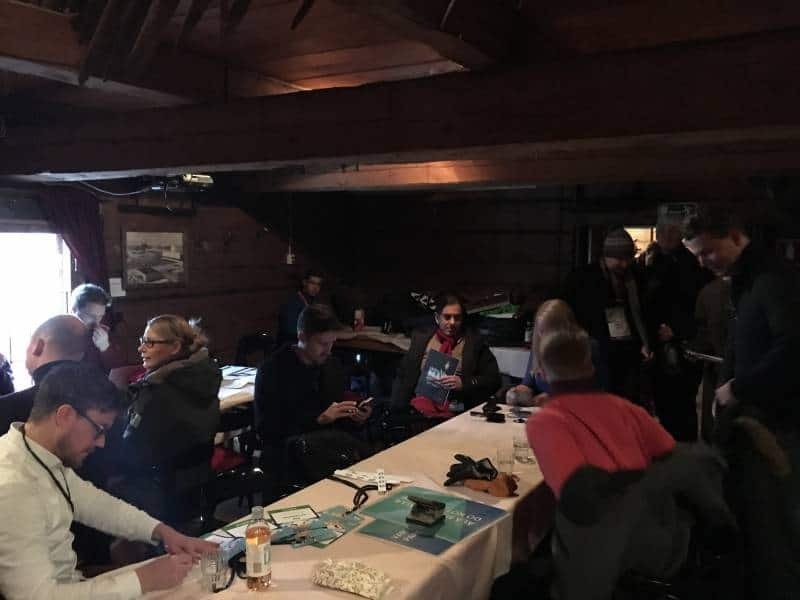 I enjoyed watching the rest of the pitches (from the comfort of heated tubs and rooms), and then I got to spend some time with the other entrepreneurs afterwards. 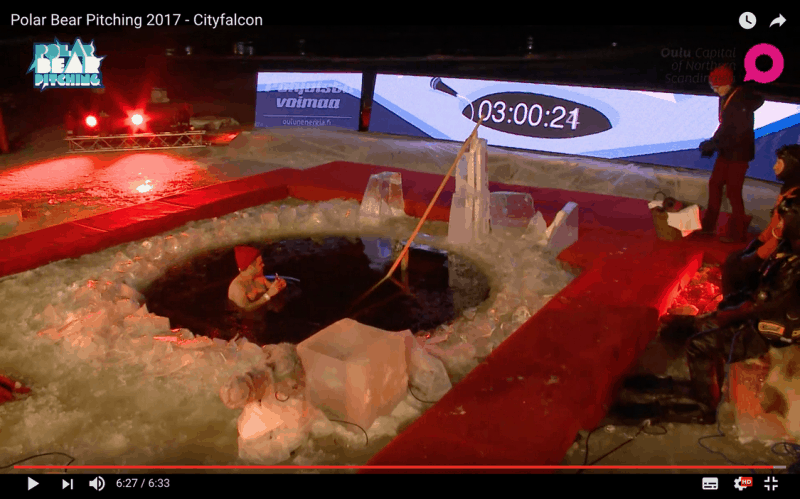 CityFALCON was not declared the winner. That went to Virta Ltd, who will now spend some time in the hallowed Silicon Valley. To them, I would like to extend my congratulations for their awesome pitch, and I wish them the best of luck. Startup founders need to support each other. The business is brutal but thrilling, and we ought to hold each other up, especially when it is deserved. Everyone who participated in this challenge deserves it. I mean, how many people do you know that voluntarily risked frostbitten bodies and hypothermia to show their love for their companies? Enjoying the hot water tub but more importantly feeling satisfied, refreshed, and ready to continue on the thrilling start-up journey. Photo by Vesa Ranta. If you don’t know us, or you haven’t seen the video, look around on our site more. Also, watch the video. It is good fun to watch me freeze myself. For software, we have published apps on Android and iOS, plus an enterprise-level API. This was all developed on limited funds. We would like to court more investors, partners, and, of course, customers. Our goal is to offer the most personalised financial services out there so our customers can make the best choices for their portfolios. If you want a piece of the pie, you can find out more about becoming an equity shareholder here (where you can also see the video). Nota bene: equity shareholders assume capital risk. As for me, well, I’m not so keen to avoid the cold now. Actually, I might try keeping the office extra cool this summer. I will see what my team thinks. a shout out and kudos to Finland, Oulu, and Team Polar Bear Pitching. Thank you for hosting us, crazy entrepreneurs.